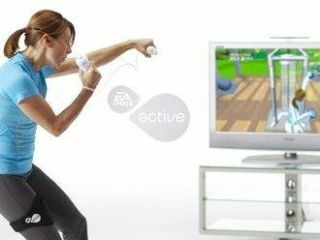 The Wii 'exer-gaming' phenomenon continues today, with Electronic Arts being the latest publisher to jump on the gaming/exercise bandwagon with EA Sports Active. EA Sports Active works in a slightly different way though – with the user strapping the Wii Remote and Nunchuck to the body, in addition to a number of (rather painful sounding) 'resistance bands'. EA Sports President Peter Moore explained to Gamespot: "It's a completely different fitness experience…There's a different philosophy between the East and West about what fitness means, and Wii Fit does very well with some of what I'll call the Eastern philosophy of fitness, which is balance and coordination. But you're rarely in danger of breaking a sweat and getting your heart rate up. It's just not intended for that. "So we immediately started building the product with a view to having a condensed time period in which you can get your heart rate up. It will measure your calories burned. It will measure time as you're doing things." Oprah Winfrey's trainer Bob Greene is endorsing the game, with Moore noting: "He obviously will be a big link to that consumer, which is important to us… Then there'll be regular iterations of software updates that might be sports specific, or it might be body part specific, like your lower body, your upper body."